Pittsburgh Penguins center Sidney Crosby passes from the corner during a power play in a regular-season game against the New Jersey Devils. Pittsburgh Penguins center Sidney Crosby is one of the most talented players in the National Hockey League. But sometimes, he also gets lucky. This clip comes from the 2013-14 season, when Crosby won the Art Ross Trophy as the league’s top scorer. On the play, the Consol Energy Center’s official scorer awarded Crosby a secondary assist even though the pass he attempted to shovel back to a teammate resulted in an apparent turnover. This type of judgment call frequently went in Crosby’s favor that year; he recorded 22 secondary assists at home, versus just 12 on the road. And it wasn’t just a one-season aberration. Few players benefit more than Crosby from the secondary assist, one of the league’s most inconsistent and superfluous stats. Over the course of his career, Crosby has recorded 150 second assists at home and only 112 on the road, a 38-helper difference that ranks seventh in the NHL since 2005-06. Point totals have a demonstrable effect on awards such as the Art Ross and Hart trophies (MVP); Crosby, for instance, doubled up on those honors in 2013-14, one of six times an Art Ross winner also took the Hart in the 11 seasons since the 2004-05 lockout — with a seventh likely coming this season in the form of Patrick Kane. They also help determine player salaries and incentive-based bonuses. So it’s worth asking whether certain players have been unfairly valued because of the way different official scorers award secondary assists. 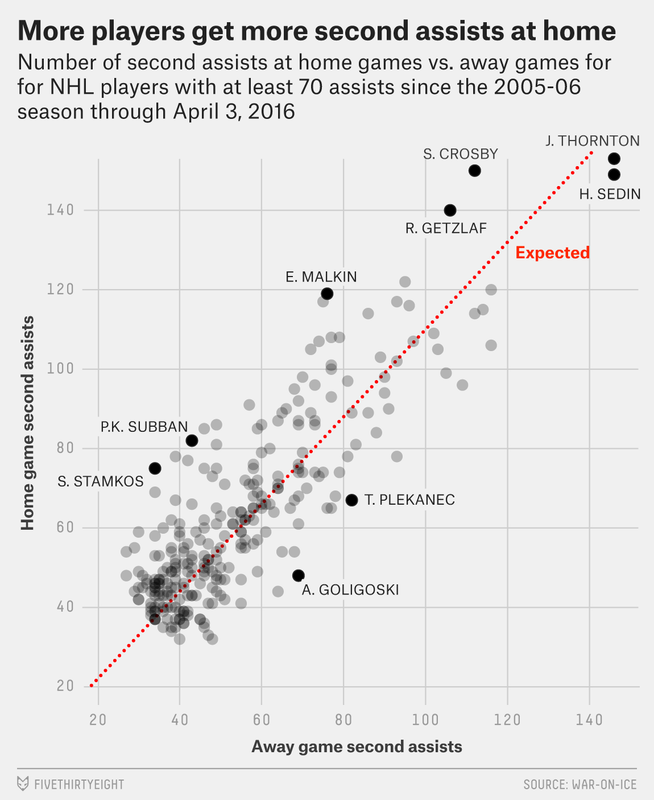 In fairness to Crosby, he’s far from the only player who earns a disproportionate number of secondary assists at home. Check out the scatterplot below, which shows career home and road second-assist numbers for players with at least 70 assists since the 2005-06 season. 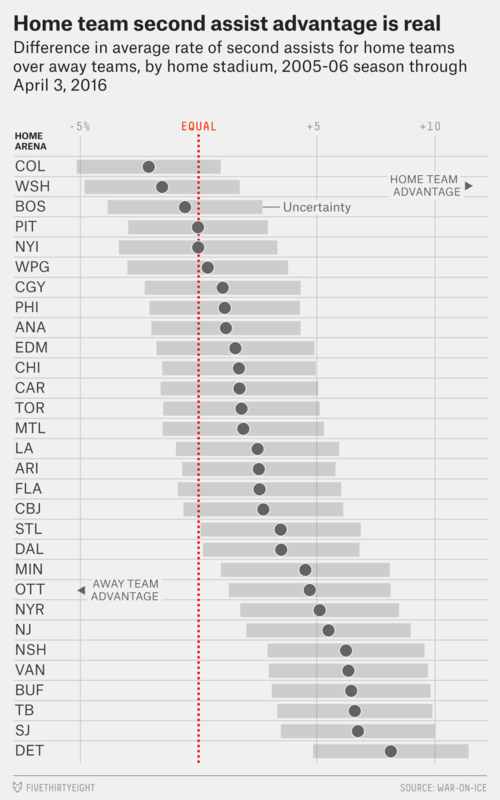 The dotted line is where we’d expect players to fall after accounting for the fact that NHL teams score about 10 percent more often at home than on the road. The further a player is above it, the more disproportionate his tendency to rack up secondary assists at home. Depending on the arena, the rate at which secondary assists are awarded varies from 70 percent of a game’s total goals (Ottawa) to 80 percent (Colorado). In effect, this means that roughly once every two games, there’s an extra secondary assist given out in Colorado that wouldn’t have been in Ottawa. That’s for all goals scored by both teams in a game; the numbers also suggest scorers might show implicit bias when awarding second assists on home goals, specifically. 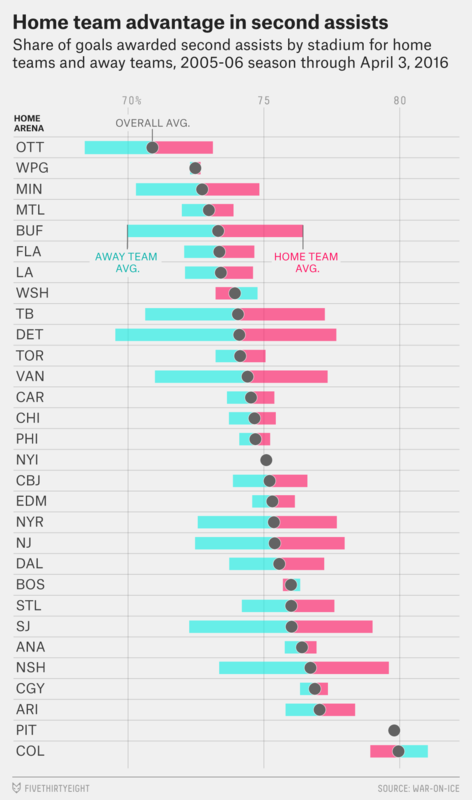 For roughly a third of the home rinks we studied,3 the difference in second-assist rates between the home team and away team was statistically significant, meaning it could not reasonably be explained away as the product of natural fluctuations. This is even true across game situations; that is, if we account for score effects (in case there are more second assists when the leading team — i.e., the home team more often than not — scores) or isolate 5-on-5 play only (accounting for possibility of more second assists on power plays, which the home team also tends to get more of), the same conclusion holds. This matches the existing research on a home-court scoring partiality in basketball — both in the NCAA and the NBA — in addition to the home-rink bias present in the recording of hits and blocked shots in the NHL. But although there appears to be some hometown favoritism involved with the NHL’s second assist, it might be difficult to do anything about it. Indeed, judging when a player should receive a secondary assist is not always clear cut. Let’s look at a pair of goals scored last season — one by the home team and the other by the away team — at Amalie Arena in Tampa Bay, the rink with the NHL’s third-biggest home second-assist bias since the lockout. First, does Anton Stralman, who lost possession by flipping the puck into a New Jersey Devils defender, deserve a secondary assist on this play? We would argue that he does not, but Stralman’s home-arena scorer thought differently. In the next clip, former Capitals center Eric Fehr carries the puck into the zone and sends it toward the slot before it eventually finds the stick of Brooks Laich, who buries it in the net. Fehr was not awarded an assist for this play, though he very well could have under the second-assist rule. Responding to a request for comment via email, NHL Vice President of Communications John Dellapina told us, “The standard for what constitutes an assist is clearly detailed for all of our off-ice officials and the expectation is that that standard will be applied.” But, clearly, that standard is applied differently across the board. In each of the above cases, the rules for awarding secondary assists left much up to the individual interpretation of the official scorer. So if there’s no way to standardize how they are awarded, perhaps the problem with secondary assists isn’t how they are handed out, but the fact that they exist at all. Since all goals and assists count equally in a player’s point tally, second assists are valuable — too much so to be awarded with such inconsistency. For instance, Steven Stamkos, P.K. Subban, Evgeni Malkin and Crosby are all household names; on the other hand, most people haven’t heard of Alex Goligoski. Malkin’s 2008-09 Art Ross win is especially suspect; he beat Alex Ovechkin that year by only 3 points (113-110) after recording 13 secondary assists at home and only four on the road. Specifically, 11 of the NHL’s 30 arenas.